Whenever I am promoting a book, I get asked: How did you come up with the idea for the story? Invariably, the answer is that something scared the crap out of me. I had to explore and, hopefully, overcome my new fear by spending the next six months immersed in it. With my first book, Dark Turns, it was my daughter that spurred the fear-related obsession. She was three and enrolled in a serious ballet class–at least relative to all the cutesy baby ballet classes in the area. My child seemed to enjoy the discipline and the private attention that came with the group’s small enrollment. However, I worried about the physical demands of the class and all that rigor destroying her burgeoning love of movement and expression. One day, the teacher excitedly showed me my daughter performing a saddle split. She had her press against a cement wall and then pushed her pelvis against the concrete until both legs stuck out on either side. 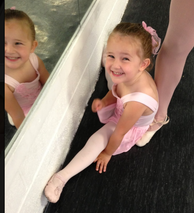 My kid smiled at me proudly and then her eyes started to water because achieving that extra inch of flexibility HURT. (This pic was a precursor to it.) I had a well controlled panic attack. Questions ran through my brain as I smiled and clapped. What does it do to a person taught to push herself beyond the limits of her physical comfort from age three? Should my child be this serious about anything at this point? If she continues on this path, what will all the rigor and pushing do to her psychologically? The book that resulted is an exploration of the worst answers I could think of to those questions. The next year, I enrolled my kid in a more fun dance class that focuses on flexibility, though less intensely. If she still has a passion for ballet at eight, she can return to a more intense version. (Meanwhile, I hope I didn’t destroy the next Sara Mearns.) For my new book, The Widower’s Wife, it was fear of our new mortgage that spurred my writing. My husband and I had purchased a house in the suburbs and paying for it was (and is) dependent upon his salary. I began worrying about what would happen if he lost his job in another financial crisis/housing crisis/Great Recession. It would be difficult for him to secure employment immediately and, if the house declined in value at the same time, we would find ourselves extremely overburdened in a year or so. My salary would never make the payments. How would we recover? How easy would it be to downsize? How would my husband stomach downsizing? I like to think that we both would be fine. We’d move away from the city. We’d use our skills differently. But… The characters in The Widower’s Wife–particularly the husband figure–are nothing like me or my spouse. As a result, the answers to my concerns are much more dramatic than they ever would be should the worst strike my family. Still, the initial fear lead me down the rabbit hole in which I found my story.